I am leaving for London on Thursday, which gives me, at this point, one day in which I have to haul my small Romanian cimbalom (tambal mic) across Pest to have the Master Cimbalom builder, A.N, take a look at it. 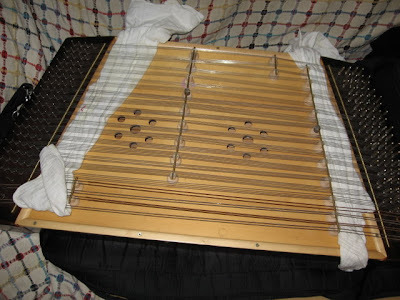 My cimbalom is a cheap Romanian factory model, and as they come out of the factory without any setup and completely unplayable, this instrument has been undergoing months of modifications to get to the point where I have an instrument that can play at the level where I can just start to learn the rudiments. At this point we have an instrument that can play in the central melody range, while the bass strings are worthless and the highest strings aren't much better. Tommorow we decide if it is worth doing the surgery necessary to turn this baby into a fully playable instrument. New strings, new bridges, staggered string holders... total reconstruction. I'm not even sure I want to learn to play the cimbalom. I'm a fiddler, after all. I pay people to play the cimbalom for me. That is how it should be. 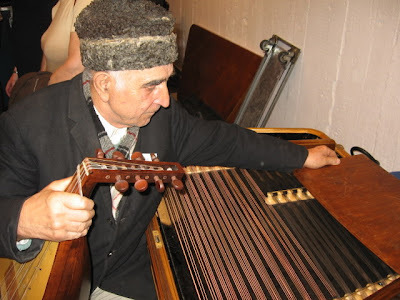 I have a great cimbalom player in my band, but there are tours when we travel to a place (Portugal comes to mind) where we have to take a plane and we can't borrow a cimbalom. Cimbaloms, mind you, are larger and heavier than most pieces of furniture... having a small one means we can hop on an airplane and not have to pay to have a small refrigerator traveling with us. speaking of tsimbls, we finally got a chance to visit Pete's place - it was all as you described in your blogpost, down to the Moskowitz tribute on one of the walls... we are playing on Saturday together - inna, ljova, and pete. London Pubs: The Reason for Empire. Riots, Flags, and Water Cannon.